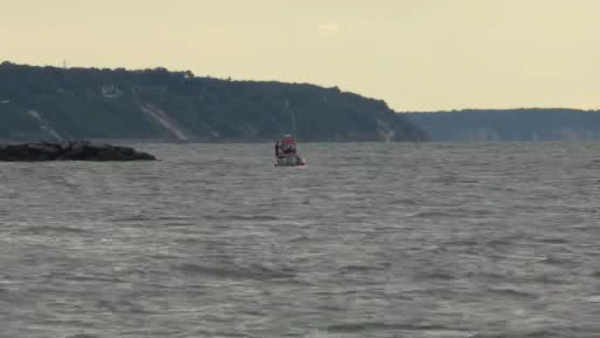 WADING RIVER, New York (WABC) -- The bodies of two fishermen were found Sunday morning, a day after they were reported missing in the Long Island Sound. The men were identified as Luis Lala, 20, and Juan Loja, 18, both of Brentwood. The bodies washed up on the beach in Shoreham early Sunday. Authorities say the two men were fishing when they were hit by a wave while crossing Wading River Creek on Saturday afternoon and pulled out into the Long Island Sound. The men's bodies washed up approximately two to three miles from where they were hit by the wave. A man walking his dog found one body Sunday around 6 a.m. and when police responded, they located the body of the second man. Suffolk County Police have now taken over the investigation. The Coast Guard says around 3:30 Saturday afternoon, reports came in that three men fell into the water while fishing on the rocks near Wading River. One man was able to pull himself to shore and call for help when he couldn't find the other two. Police say they searched late into the night but couldn't find the men. The search had resumed Sunday morning.